Home » »Unlabelled » 7-Year-Old Battling Kidney Disease Meets Favorite Wrestler John Cena. 7-Year-Old Battling Kidney Disease Meets Favorite Wrestler John Cena. 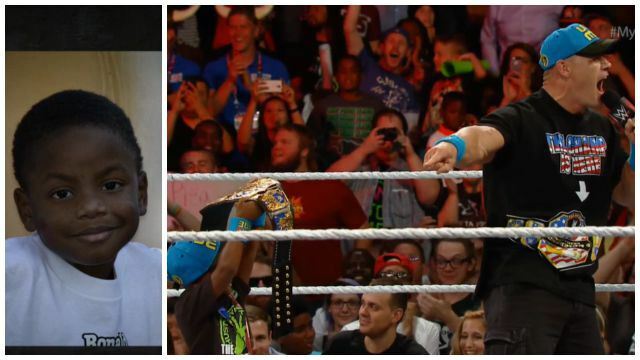 John Cena may be the reigning WWE Champion, but when 7-year-old K.J. Lamar entered the wrestling ring with him recently, Cena insisted that there was another victor in the house. “We have a special guest… He is easily the smartest 7-year-old I have ever met. Ladies and gentleman, this is K.J. And the champ is HERE,” he shouted, pointing at the boy as thousands in the audience cheered during a taping of "Monday Night Raw." K.J. has struggled with kidney problems since birth. According to an ESPN video documenting his story, his left kidney wasn’t working at all when he was born and the right only functioned at 40 percent. By the time he was 6, K.J. had to begin dialysis treatments. “I had an aunt who died while she was on dialysis, so that was my first thought,” said K.J.’s mom. Fortunately, K.J., who lives in Orange County, Florida, bravely pulled through and received a life-saving kidney transplant in October. He’s currently taking medication to ensure that his body doesn’t reject the new organ. To support K.J. during this time of recovery, the Make-A-Wish Foundation recently stepped in to help the boy fulfill a longtime fantasy. K.J. is a big wrestling fan and he’s always wanted to meet his favorite wrestler, John Cena. With K.J., the wrestler pulled out all the stops. He first surprised the kid with a special video delivered by none other than wrestling veteran Triple H. He then invited K.J. and his mom to be his special guests at Monday Night Raw. There, K.J. spent some quality time with Cena, who showered him with gifts and introduced him to other wrestling stars. The icing on the cake was when Cena honored K.J. with a tribute in the ring. "It would be the best day of my life ever," the boy told WFTV.com of the experience. Watch the video about K.J. and his wish come true above.